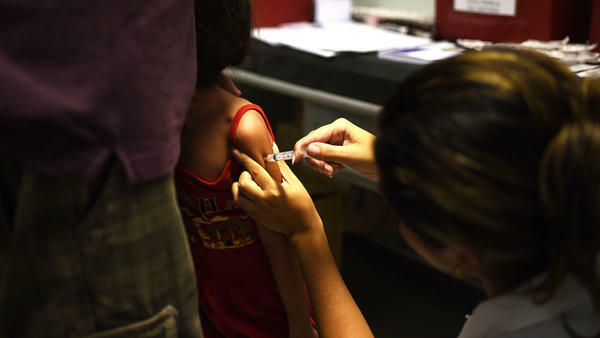 A girl is vaccinated against yellow fever in Rio de Janeiro. For the first time ever, Brazil is attempting a nationwide immunization campaign against yellow fever. An ongoing outbreak of the mosquito-borne disease has killed hundreds of people in parts of Brazil where yellow fever traditionally wasn't considered a threat and most residents aren't vaccinated against it. "We can call this the biggest outbreak in modern times," says Dr. Mauricio Lacerda Nogueira, the president of the Brazil Society for Virology. "Since the middle of the 20th century we never had an outbreak of this size." In a normal year, a few dozen people at most get sick with yellow fever in South America's largest nation. But since 2016 Brazil has confirmed more than 1,900 cases and recorded at least 590 deaths from the disease. This is fairly astonishing for a number of reasons. First Brazil is a country that has effectively reined in yellow fever outbreaks in the past. The nation is one of the largest producers of yellow fever vaccines in the world. And it has a sophisticated public health system that routinely vaccinates for yellow fever across most of the country. So why, nearly two years after this outbreak began, is Brazil still struggling to stop it? Dr. Pedro Fernando Vasconcelos, the head of Brazil's National Institute of Science and Technology for Viral Hemorrhagic Fevers, says the outbreak caught the country off guard. "All the people who died were outside the recommended area of vaccination," Vasconcelos says. The current cases are clustered in rural areas surrounding the megacities of Sao Paulo and Rio de Janiero. These are parts of the country where doctors rarely used to see yellow fever. Researchers are still trying to determine what's caused this change. The yellow fever virus is endemic in Brazil's tropical rainforests, where it circulates between monkeys and mosquitoes. Human cases pop up when loggers, farmers or miners working near the forest get bitten by infected mosquitoes. As its name suggests, the disease comes on with a fever. In mild cases the person may appear to have little more than a flu. In severe cases the patient can suffer severe kidney damage, which causes jaundice that gives their eyes and skin a yellow tinge. The worst cases cause heart and liver failure, which can kill a patient within a week. The great fear from a public health perspective now is that yellow fever might spread to an urban area and start to run rampant in one of Brazil's crowded cities. So far that hasn't happened in this outbreak, but the U.S. Centers for Disease Control and Prevention views it as a possibility. Last month, the CDC recommended that travelers even to the megacities of Sao Paulo and Rio de Janiero get vaccinated. "I mean monkeys were dying off in the parks areas on the outskirts Sao Paulo," says Martin Cetron, the head of the CDC's division of global migration and quarantine. "There is an expanding number of hot spots in Brazil where yellow fever virus is being transmitted. These are atypical areas in large states that have not previously seen this amount of viral activity in decades," he says. Cetron is the lead author of a new CDC report recommending that travelers to most parts of Brazil get vaccinated for yellow fever. The only problem is that the only yellow fever vaccine licensed for sale in the U.S. is currently unavailable. "Right now the one U.S.-licensed yellow fever vaccine YF-vax is out of stock," Cetron says. The CDC has worked out an arrangement with the Food and Drug Administration to allow the French pharmaceutical company Sanofi Pasteur to temporarily import Stamaril. Stamaril is widely used outside of the U.S. and is considered just as effective as YF-vax. "The challenge is that only a limited number of clinics in the United States have Stamaril," Cetron says. The CDC has posted where Stamaril is available on its website. Brazil meanwhile is also facing a significant shortage of vaccine. Back in 2016 before Brazil's domestic yellow fever problem became evident, Brazil sent millions of doses from its own stockpile to fight an outbreak in Angola that had spilled over to the Democratic Republic of Congo. Now Brazil doesn't have enough vaccine to give full immunizations to the 23 million people in the states of Sao Paulo, Rio de Janeiro and Minas Gerais considered at immediate risk. "Especially in the big cities like Sao Paulo and Rio de Janeiro they are using fractional doses," says Dr. Nogueira. A "fractional" dose is when health officials split a normal dose of vaccine into smaller parts to stretch their supply. In Brazil they're giving people one-fifth of the normal amount. "We need to do this right now and then go back again and do a complete dose if necessary," says Nogueira. "We have to treat this as a stopgap measure. Do it as fast as we can and then we have to analyze how [effective] it is." Fractional doses of yellow fever have been used in other outbreaks and appear to offer at least short-term immunity to the disease. The full dose however is believed to protect a person for life. So one downside of fractional dosing is that all those recipients may need to be vaccinated again later. Brazilians have been clamoring for the shot. The shortage got so bad in February that at one point, a gang leader in Rio kidnapped a pair of vaccinators and had them immunize the residents of his favela. Social media hailed him as a modern day Robin Hood. Brazil is attempting to produce more vaccine to meet the huge demand, but producing inoculation is a slow, complicated process. "The vaccine is made in specific, pathogen-free, embryonated chicken eggs — which means you've got to have special clean chicken flocks laying the eggs," says Tom Yuill a professor emeritus at the University of Wisconsin who monitors disease outbreaks, including yellow fever, for ProMed at the International Society of Infectious Diseases. If you're wondering what an "embryonated" chicken egg is, it's an egg that's not just fertilized but in which the embryo has started to develop. "The manufacturing process is kind of slow and tedious," Yuill says. "It takes time to ramp it up. You've got to get enough eggs to do it. It's just not very efficient." He says this current Brazil outbreak, in addition to a smaller outbreak last year in Nigeria, has stretched global vaccine supplies to their limits. If another large yellow fever outbreak erupts somewhere, he says, the world is ill-equipped to suppress it. "That's really what keeps me awake at night," says Yuill. The same mosquitoes that spread dengue are also capable of spreading yellow fever. Yet in many parts of the world that regularly have significant dengue outbreaks people are not regularly immunized for yellow fever. "You think of Southeast Asia and South Asia, the overwhelming majority of the population in those countries have not been vaccinated," Yuill says. If a yellow fever outbreak started in India or Pakistan, he says, it could be a disaster. "Even if there were vaccines available, it would be difficult to contain. In the absence of very large yellow fever vaccine stocks I think it would be extraordinarily difficult to get ahead of an outbreak like that — which would mean lots of dead people." For the first time ever, Brazil is attempting a nationwide immunization campaign against yellow fever. Yellow fever is a mosquito-borne disease. An ongoing outbreak has killed hundreds of people over the last two years. And the deaths have occurred mostly in parts of Brazil where yellow fever didn't used to be a threat. NPR's Jason Beaubien reports. JASON BEAUBIEN, BYLINE: Up until recently, Brazil's health ministry recommended yellow fever vaccination primarily in the hot, tropical, inland parts of the South American nation. The belief was that the risk of getting yellow fever in most of the east and the south of the country, including around the megacities of Rio de Janeiro and Sao Paulo, was extremely low. But this current outbreak has changed that. MARTIN CETRON: I mean, monkeys were dying off in the parks and forested areas, you know, right on the outskirts of Sao Paulo city. BEAUBIEN: That's Martin Cetron, the head of the Centers for Disease Control and Prevention's Division of Global Migration and Quarantine. CETRON: There is an expanding number of hotspots in Brazil where yellow fever virus is being transmitted. And these are atypical areas in large states that have not previously seen this amount of viral activity in decades. BEAUBIEN: In a normal year, Brazil gets hit with at most a few dozen cases of yellow fever. But since 2016 the country has confirmed more than 1,900 human cases, and 590 people have died. Almost all of these have been in rural areas around Sao Paulo and Rio de Janeiro that the government in the past didn't think were at risk from yellow fever. Brazil is now attempting to inoculate more than a tenth of its population by the end of April, and then expand the program to cover the rest of the country by the summer of 2019. Unfortunately, there's a global shortage of vaccine right now. And even though Brazil is one of the world's largest producers of the serum, they don't have enough to go around. People have been desperate to get it. In February, a gang leader went so far as to kidnap two vaccinators and had them inoculate people in his favela in Rio. Social media hailed him as a modern-day Robin Hood. TOM YUILL: Yeah, that was really kind of ironic and folkloric. Yeah, they had a vaccine program kind of at gunpoint, I guess, to get coverage in these slum areas. BEAUBIEN: Tom Yuill is a virologist who monitors disease outbreaks, including yellow fever, for ProMED at the International Society of Infectious Diseases. The Brazilian Ministry of Health has resorted to dividing single doses of vaccine into fifths to stretch their limited stockpile. This practice of splitting doses appears to offer at least some short-term immunity to yellow fever. Yuill says the current campaign to try to get 23 million people vaccinated in the coming weeks is a huge challenge. YUILL: So they've got a lot of ground to make up to try to get adequate vaccine coverage, shooting for between 80 and 90 percent in areas of risk. And that requires an awful lot of vaccine and the logistical organization to be able to get the vaccine into the people in a timely way. BEAUBIEN: This yellow fever outbreak in Brazil started a year after zika first exploded in the country. The head of the country's virology society says while Brazil probably overreacted to zika, it's now in trouble because it underplayed the threat of yellow fever. Jason Beaubien, NPR News. (SOUNDBITE OF SEA WOLF SONG, "CEDARSMOKE") Transcript provided by NPR, Copyright NPR.